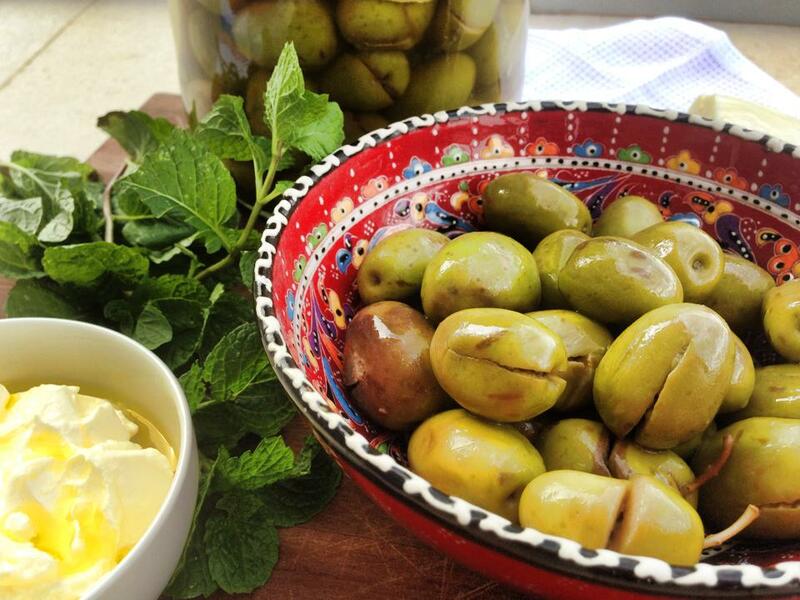 Now that the warm sun is slowly making room for cool breezes and rainy days, after it had plenty of time to nurture and ripen olives throughout the summer months, these delicious fruits are now ready to be pickled and enjoyed. 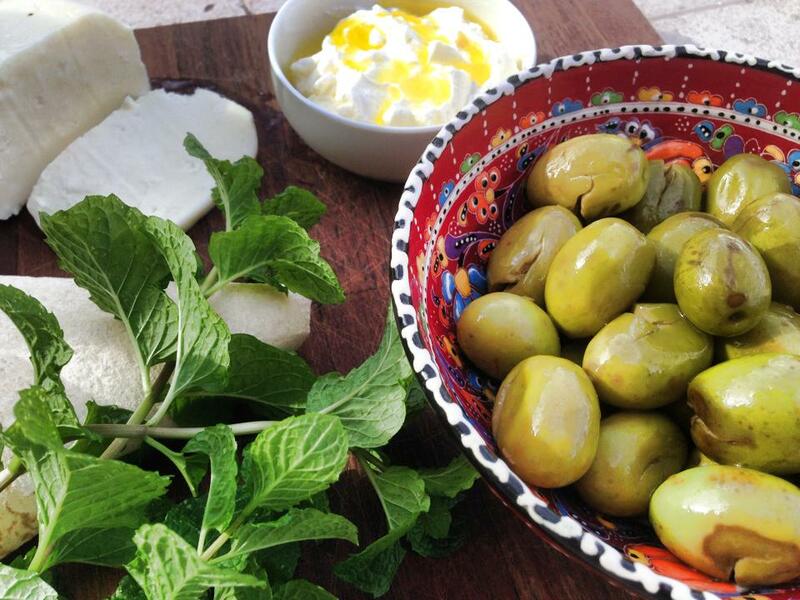 I will be sharing with you today a traditional recipe that comes from the northern part of Lebanon, which is renowned for its olive groves and virgin olive oil. I grew up with my mother pickling olives every year, and I can assure you that making a couple of jars is not a difficult or tedious job at all. Now if you are preparing enough olives for a whole year’s supply then that’s a different story. All that is required is a bit of patience as you wait for them to pickle, but they’re definitely worth the wait. 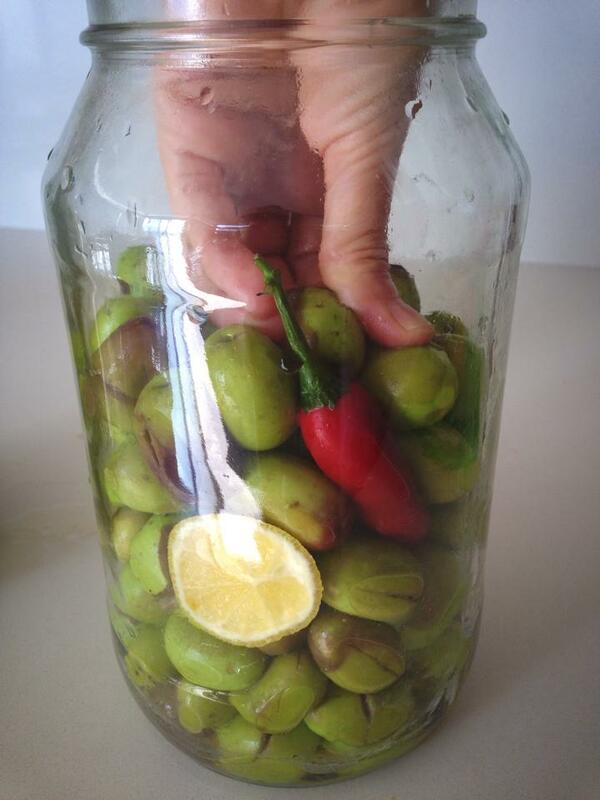 So I hope you give it a go and get to enjoy crisp freshly pickled olives that are full of flavour. Some people use vinegar when pickling olives, I do not recommend it. Others also flavour the olives with bay leaves, fennel stalks and leaves or oregano leaves, that is fine but do stick to one herb. I prefer to keep mine plain and add flavours later on as a variation. When ready for consumption, I place some in a bowl and flavour them with lemon juice, a few dry or fresh oregano leaves and perhaps some sliced chilli and a tiny drizzle of olive oil. Otherwise I am happy to have them as is. Remember the longer the olives are left to pickle the more these flavours develop so I wouldn’t recommend too many herbs if you are planning to make a few jars and store them to be consumed months later. Important note: Do not use refined table salt. 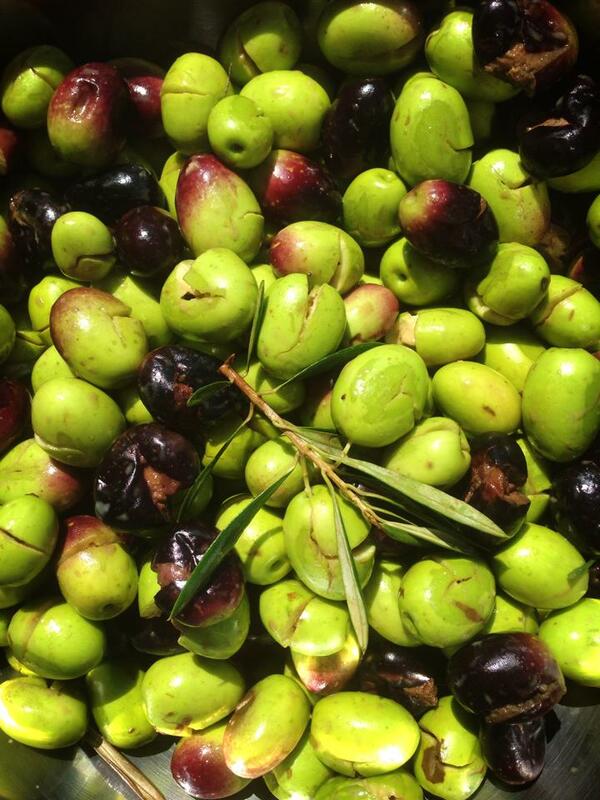 Your salt must be coarse unrefined sea salt without anti-cracking agents, otherwise your olives will turn soft. Note: Make sure you clean the jar really well with detergent and hot water, then dry it prior to using it. If you do not have filtered water, make sure you boil the water first, and pour into a bowl then wait for it to cool down completely before using it. When cool, tip it into another bowl making sure all sediments are left in the bottom of the initial bowl, before you melt the salt in it. Rinse olives well under running water. Drain in a colander, then pick a few handfuls and place them in a clear plastic bag. Spread them so they form one layer and then using a pestle, it can be wooden or stone, crush each one individually. Do take care not to crush them entirely, you just need to split them open. Therefore experiment with the first few so you can determine the amount of force that is required. When you finish with the first batch, place the olives in a large bowl and repeat the process until they are all finished. 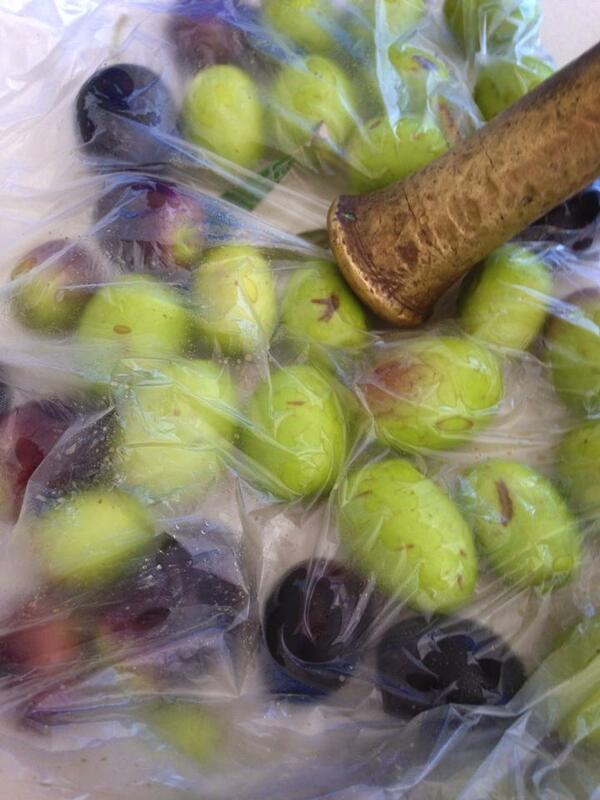 I use a plastic bag so the olive juices do not splatter all over me. This is a neat and very effective way of doing them.The bag needs to be clear so you can see what you are doing. 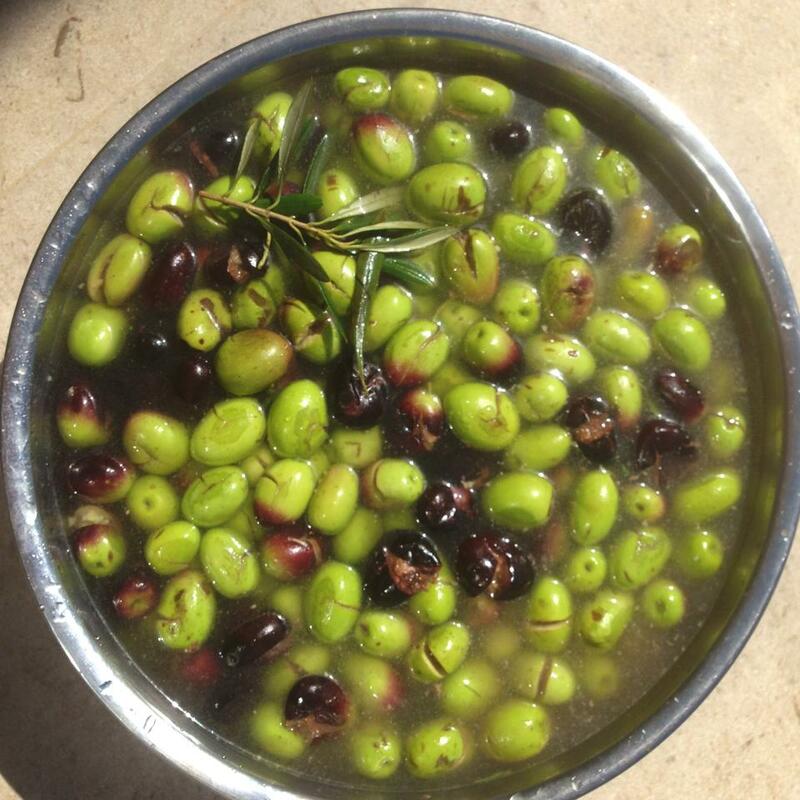 Once all olives are finished, cover them with water, cold or room temperature. keep them covered in water for 24 – 48 hours maximum, changing the water once half way through. Rinse them again after 24 hours and put them aside. In a separate bowl, dissolve the salt in the filtered water. Then put two tablespoons of olive oil in the jar, then start packing your olives firmly in the jar, add a slice of lemon to the side of the jar and continue to pack the olives, adding more lemon slices as you work your way up and add the chilli mid way too. Make sure you leave two centimetres space up the top. Pour the salt and water mixture into the jar until you cover the olives completely. Place the jar on a tray or a plate on top of your kitchen bench with the cover just resting on top covering most of the opening. Let it sit for about three days until it is no longer bubbling up. It may spill some liquid which will be trapped on your tray or plate. At the end of the three days or so, when it is no longer bubbling you will notice that some foam has formed on top. Remove the foam which will be brownish in colour and clean the rim of the jar. Add extra olive oil to cover the olives completely, then close the lid tightly and wait for about four weeks and they should be ready for consumption. I opened mine a week later, but I am used to the slightly bitter taste of olives and actually love it, however if you are making them for the first time, you might find the taste a bit strong. 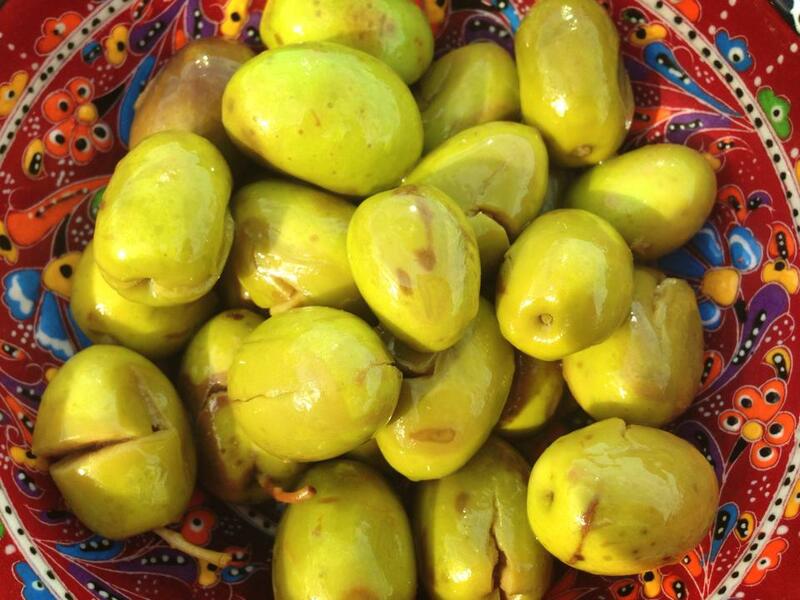 Test them after a few weeks, as time required might vary from one type of olives to another. Consume when they are pickled enough to your liking. Tags: cleaneating, culture, diet, food, glutenfree, healthy, inspiration, Lebanese, life, recipes, vegan, vegetarian. Bookmark the permalink. Please let me know if you can use this recipe for black olives too? Many thanks – where are you resident? I assume you are using rock salt or ‘kosher’ salt? 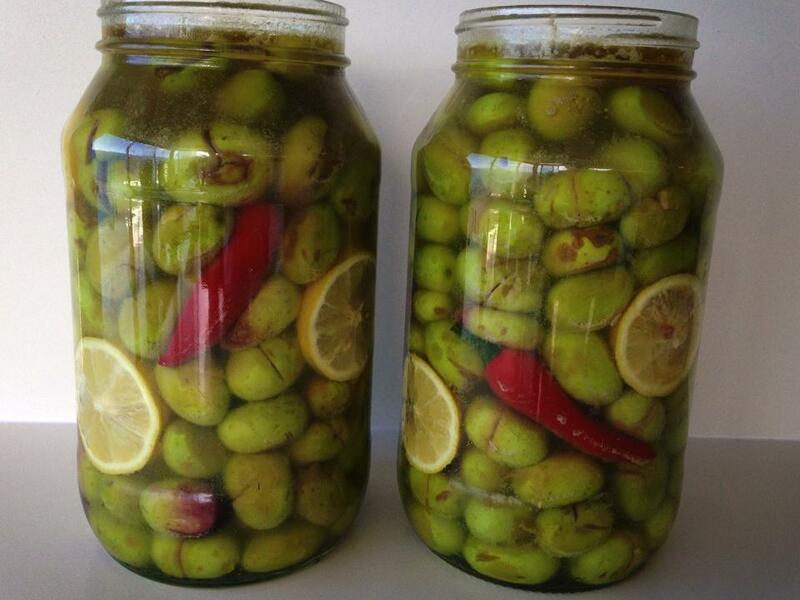 Have been brining and marinating olives for 2 or 3 harvests – large amounts! And Laura, I have been using this traditional recipe for over 20 years. U r safe. If you wish to keep your olives for much longer, since you are using large amounts, then keep some jats without the lemon and chili. 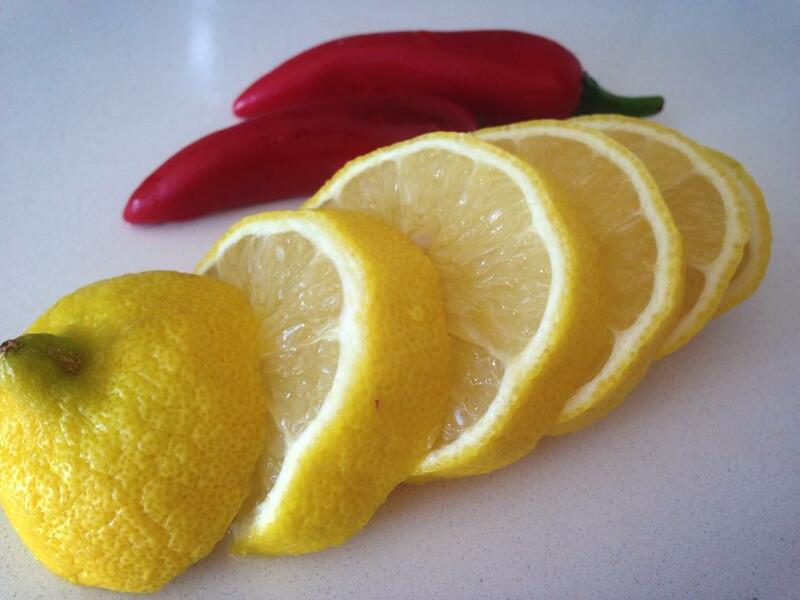 Add lemon when you are ready to open the jar. Also skim off any impurities off the top of the jar every month or 2 months. Cover the top of olives with a couple of grape-vine leaves. 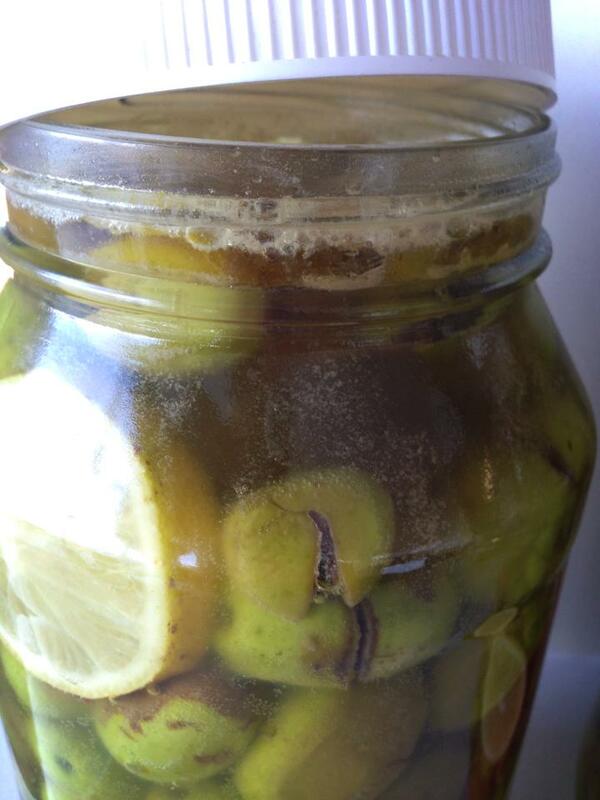 This will keep olives soaking in the brine and make it easier to skim off the impurities that will surface on top. Yip Maldon salt is good. Available in all/most supermarkets now. I am also in Sydney. Oh, how I wish I could get my hands on some green olives…I will keep my eyes peeled but don’t hold out much hope! Yours look fabulous! Selma, oh that’s a shame. Autumn is the season so in November I’m guessing is the time for your part of the world!!! Haha, yes a very good idea 🙂 olives are in season now, fruit markets should have them, ask the fruit and vegetable shops, they might be able to get them for you. Good luck, they’re definitely worth it. tTis looks like a delicious recipe. I’ll save it to my recipe file.